Things of note: Often referred to locally as Scofton and was originally built to assist Bircotes with satellite duties for Finningley. First closed in 1948, but reactivated in August 1952 to aid flight training for the Korean War. 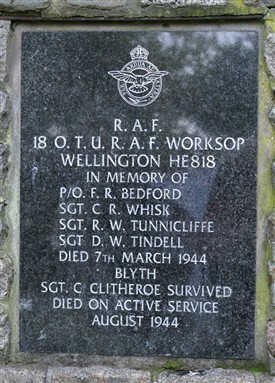 A memorial at nearby Blyth (Grid Ref: Sheet 111; SK626868) a memorial commemorates two aircraft and crews that were lost close to the village during World War II. One of these was Wellington HE818 from No.18 OTU at RAF Worksop, which crashed approximately 200m from the site of the memorial on 7th March 1944. 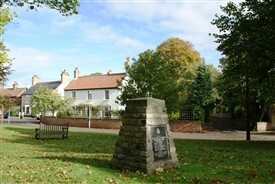 The memorial site is in leafy shade on the village green and was erected on 14th September 1997. Current status: Officially closed in December 1960 and thereafter many buildings were demolished; the current existence of some parts of the main runway has not been confirmed. A small part of the airfield was ‘preserved’ at Newark Air Museum. In the early 2000s work was undertaken to join two parts of the museum site together. As part of this project 500 tonnes of crushed concrete and asphalt were recovered from the former RAF Worksop runway on the Osberton Hall Estate near Scofton. The Newark Air Museum is keen to locate any in-service photographs of aircraft and personnel that were operating from Worksop. This page was added by Howard Heeley on 29/12/2014. 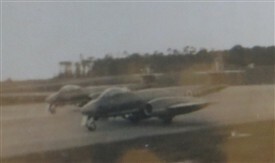 Scofton Airfield hasn't changed much judging from your photo of the Meteor Jets. It was the trees I immediately recognised.